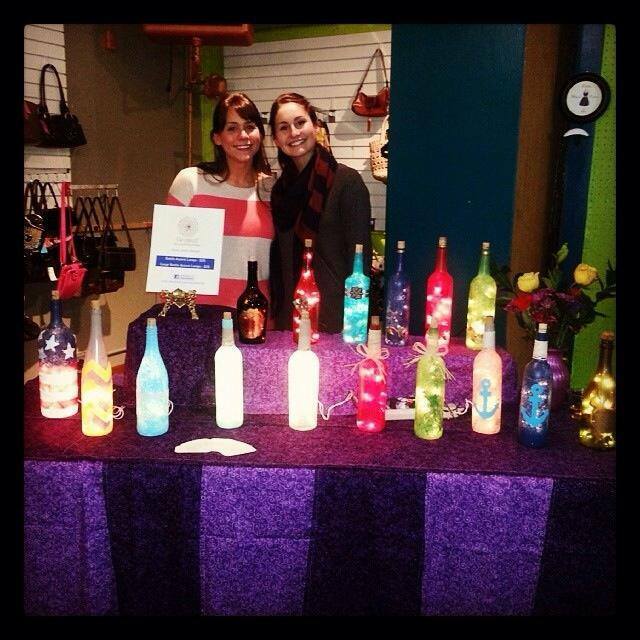 My sister and I at my First Friday Art Show @ Jade Boutique! Creating unique, one of a kind home decor one wine bottle at a time. Growing up my best friend’s mom, Alison, was very into painting. She would take the label off bottles and paint beautiful flowers, then turn the bottle into a soap dispenser. Alison was my second mom; her and my mom would trade off soccer practice duty, rides to school, feeding us girls, taking care of us when sick. I would sit with her while she painted and help take off labels, sometimes even help her drink some of the wine. It was inspiring to me to see her art. Alison passed away my senior year of high school. Her loss was devastating. About a year later I started to paint. My first lamp had a peacock on it and the lights were shoved through the stem of the bottle. It was a healing process for me. My mom took great interest in the little lamp I created. My mom and I figured out how to string the lights through and for about two years we have been creating and selling the bottle accent lamps. We have taken over what used to be the kitchen counter as our art space, and we collaborate over new designs and processes. My mom and I have a lot of fun painting and hanging out together. My mom is my best friend, and I see Alison in all of our work. I enjoy being able to share my hobby. I hope my mom and I can add a little more light to your life! Check out my Facebook here. & Instagram here. Alison’s daughters & us girls. Circa 2009. Alison was a loving and caring mother. She inspired our other best friend to attend culinary school and now her and her husband (she met while pursuing her culinary dreams) are starting a fine dining business together. She shaped many moments in my life and helped all four of us girls to connect with our creative talents. Alison has two daughters: a photographer and my best friend who has innate creativity and the most detailed eye for aesthetics, with goals to become a cosmetologist. Creativity pours from those who knew Alison, I believe it is her blessing to us.